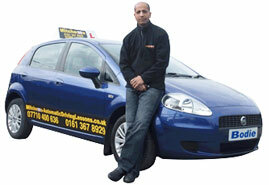 Manual and Automatic Driving lessons, Crash Course Assessor, Pass Plus Instructor, Fleet Driver Trainer. Hi, my name is Bodie and I am a fully qualified driving instructor. I am ten years post qualified which means I have valuable teaching experience. I teach in both a manual and automatic cars which means I have the knowledge of teaching a wide range of students with differing abilities. I pride myself on my varied knowledge both practical and class roomed based which enables me to teach driving skills to a very high standard. I would consider and often I am told that I have a very calming and patient approach to teaching and when coupled with my out going manner this gives a relaxed atmospheric lesson for my student. When a student is comfortable with their instructor it means there is a less stressed atmosphere to learn to drive in. Due to my vast experience of students I am able to adapt my teaching and lessons plans to cater individually for each student as all students learn at a different pace. It gives me great satisfaction to be able to pass on a life skill to a student by teaching them to drive safely with road awareness. There is nothing more pleasing to see a student who has passed with you driving and driving well.